Cut the blade steak into 5cm cubes. Heat the oil in a large frying pan and brown the meat over a moderately high heat until well browned. Transfer to a casserole. This is best done in 2-3 batches. Add the onions or shallots to the pan and cook for about 3 minutes, before adding the garlic and cooking a further minute. Sprinkle the flour over and stir well to coat the onions. Gradually pour in the Guinness and beef stock and bring to the boil to make a smooth sauce. 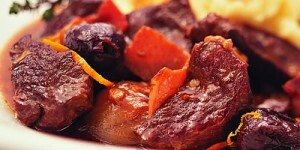 Pour over the meat in the casserole and then mix in the bacon, thyme, prunes and orange rind. Cook at 160°C for 1½ – 2 hours or until the meat is tender. Serve over mashed potatoes.